The visual monitoring of manufacturing processes, optical quality inspections, the detection of surface defects and completeness checks for features on complex products have become essential in industry. The challenge today is less in the implementation of a visual inspection system but rather is increasingly in the acquisition of specific product characteristics that are accurate to a few micrometers. With the need for economic efficiency and an enlarged awareness of quality requirements, 100 percent inspections through image processing are becoming increasingly widespread. High-resolution measuring cameras only perform to full capacity with sophisticated lenses of equivalent quality in tandem with the correct lighting. Depending on the application, the components are chosen individually, and highquality image capture is only permitted with best optical transmission chain. The recieved information then forms the basis on which efficient image analyzing software in conjunction with powerful computing technology can perform high-precision object recognition, measure lengths and coordinates and verify position accuracy and check for faults. It is always the right decision to opt for high-grade tools to assess the quality of products or processes. At this, JENOPTIK Laser, Optik, Systeme GmbH will offer you the best possible support to accomplish these aims and objectives. Our standard range of high-precision lenses for image processing includes a series of telecentric measurement lenses and well matched telecentric transmission illuminators. The range also includes megapixel lenses for sophisticated applications. Here, our P-lens for inspecting cavities is a special highlight. Frequently, standard lenses are only the basis for a single optical setup that is optimally aligned to a given application. Therefore, in the case of multiple industrial utilization, it is worth to have an optical solution specially tailored to the application in question. In order to save time and money in the serial production, a compromise must be found between standard products and specially developed equipment at outset of a specific application. Our specialists and engineers have developed numerous custom-tailored solutions that are being manufactured in large quantities today. JENmetarTM 0,075x / 9 The lens can be mounted through a clamp connection on the cylindrical surface. Center-of-gravity position: 230 mm from reference face. JENmetarTM 0,1x / 9 The lens can be mounted through a clamp connection on the cylindrical surface. Center-of-gravity position: 168 mm from reference face. JENmetarTM 0,15x / 9 The lens can be mounted through a clamp connection on the cylindrical surface. Center-of-gravity position: 154,5 mm from reference face. JENmetarTM 0,3x / 9 The lens can be mounted through a clamp connection on the cylindrical surface. Center-of-gravity position: 62 mm from reference face. JENmetarTM 0,1x /12 The lens can be mounted through a clamp connection on the cylindrical surface. Center-of-gravity position: 240 mm from reference face. JENmetarTM 0,13x /12 The lens can be mounted through a clamp connection on the cylindrical surface. Center-of-gravity position: 168 mm from reference face. JENmetarTM 0,2x /12 The lens can be mounted through a clamp connection on the cylindrical surface. Center-of-gravity position: 154,5 mm from reference face. 0,4x /12 1μ The lens can be mounted through a clamp connection on the cylindrical surface. Center-of-gravity position: 62,3 mm from reference face. JENmetarTM 0,7x /12 The lens can be mounted through a clamp connection on the cylindrical surface. Center-of-gravity position: 104 mm from reference face. 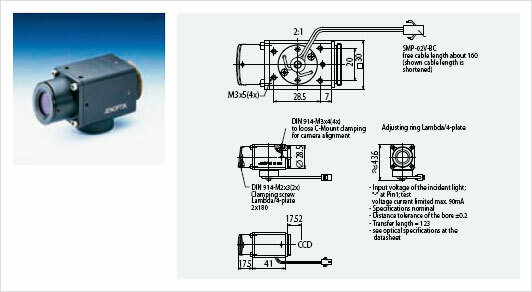 JENmetarTM 0,3x /11 1μ The lens can be mounted through a clamp connection on the cylindrical surface. Center-of-gravity position: 62 mm from reference face. JENmetarTM 1x /12 LD The lens can be mounted through a clamp connection on the cylindrical surface. Center-of-gravity position: 78,4 mm from reference face. JENmetarTM 0,35x /15i The lens can be mounted through a clamp connection on the cylindrical surface. Center-of-gravity position: 89 mm from reference face c-mount. JENmetarTM 0,35x / 22 The lens can be mounted through a clamp connection on the cylindrical surface. Center-of-gravity position: 89 mm from reference face c-mount. JENmetarTM 0,53x /43 The lens can be mounted through a clamp connection on the cylindrical surface. Center-of-gravity position: 170mm from reference face. JENmetarTM 0,6x / 8 The lens can be mounted through a clamp connection on the cylindrical surface. Bright-field incident light illumination with polarized light, with rotable l/4-plate. Integrated incident light illuminator with LED without droping resistor. Illuminated object field diameter: 10 mm. Telecentric projection of the light source. The direction of the light adapter to C-mount is adjustable.